Outsiders often have an insight that an insider doesn't quite have. It’s as basic as this, If you need to be altogether educated about all that is making news and all that is not in the nation, read up! 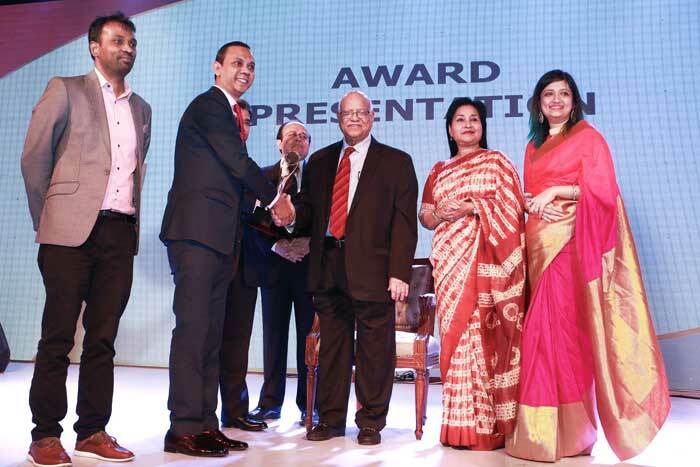 IPDC Finance Limited, the first financial institution of Bangladesh established in 1981, has been awarded the second position under the category Financial Services Sector for Best Presented Annual Report 2016 by Institute of Chartered Accountants of Bangladesh (ICAB). The award giving ceremony was held on Saturday, 25 November 2017 at Pan Pacific Sonargaon hotel in the capital. This company’s annual report has also been nominated for SAFA BPA Reports Award 2016 competition. Mr. Abul Maal Abdul Muhith, MP, Honourable Minister of Finance, Government of Bangladesh was present there as the Chief Guest and Mr. Tofail Ahmed, MP, Honourable Minister of Commerce, Government of Bangladesh was as special guest at the ceremony. From ICAB, Adeeb Hossain Khan FCA, President of ICAB and Parveen Mahmud FCA, Chairman of RCPAR-ICAB and from IPDC Finance Limited, Mr. Mominul Islam, Benozeer Ahmed, Chief Financial Officer and Mahzabin Ferdous, Head of Corporate Communication were present at the ceremony. Mr. Mominul Islam, Managing director and CEO, IPDC Finance Limited said, “We are humbled and honoured to receive this award from ICAB. IPDC has always focused on maintaining proper corporate governance by guaranteeing transparency, fairness and accountability. At IPDC, we will continue to remain transparent and provide sufficient disclosures to our customers, shareholders, regulators and other stakeholders by upholding highest ethical standards”. AFM Barkatullah, Deputy Managing Director, IPDC Finance Limited, presides over a workshop on ‘Anti-Money Laundering/Combating the Financing of Terrorism’ (AML/CFT) in Khulna recently. IPDC Finance Limited recently organized a day long workshop on AML/CFT to build a good relationship with other financial institutions. Employees from financial institutions of Khulna, Barisal and Jessore participated in the workshop held at City Inn Limited in Khulna, said a press release. AFM Barkatullah, Deputy Managing Director, IPDC Finance Limited chaired the workshop. Md. Sawkatul Alam, Deputy General Manager, Bangladesh Financial Intelligence Unit, Bangladesh Bank was present there as the chief guest. Mohammad Mahbub Alam, Joint Director and Mohammad Ismail Prodhan, Deputy Director of Bangladesh Financial Intelligence Unit and Shah Wareef Hossain, CAMLCO and Md. Zakir Hossen, CFA, Deputy CAMLCO from IPDC Finance Limited were present as special guests at the workshop. Barkatullah said, “We’re very delighted to organize a workshop for the professionals working for different financial institutions. 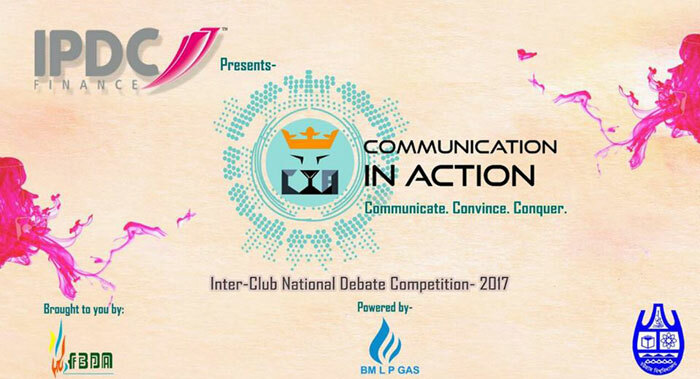 IPDC Finance Limited, the first financial institution of Bangladesh established in 1981, has recently facilitated the first ever inter club national debate competition ‘Communication in Action’ CIA-3. IPDC Finance Limited, the first financial institution of Bangladesh established in 1981, has recently facilitated the first ever inter club national debate competition ‘Communication in Action’ CIA-3. CIA is the signature debate tournament of FBDA, a debating organization of the Department of Finance, University of Chittagong. A total of 48 teams from the debate clubs of different academic institutions of Bangladesh including DU, CU, NSU, Brac, SUST, BUET, IBA DU, KUET, IUB and other private universities, colleges and schools from all over Bangladesh participated in CIA-3, one of the biggest debating tournaments of the year. The final round of CIA-3, presented by IPDC Finance was held at School of Science Business and Humanities (SSBH), Panchlish with adjudicators from top corporate houses in the country. The grand finale took place in the Crystal Ball Room, Hotel Agrabad, Chittagong. North South University won the Champions Trophy while IBA-DU stood as the Runner Up. Anirban Sarker, Branch Manager, IPDC Finance Limited was present in the event as the guest of honour in the program. Mr. Anirban Sarkar, Chittagong Branch Manager, IPDC Finance Limited said, “To bring the students together from all over Bangladesh and build up their communication with other students, we’ve come forward for this debate competition. We hope it has enabled them to develop their communication skills as well as their knowledge”. PDC Finance Limited, the first financial institution of Bangladesh established in 1981, took up day long activities including road rally and miking with the slogan ‘Nijer Bari Nijer Shohor’. 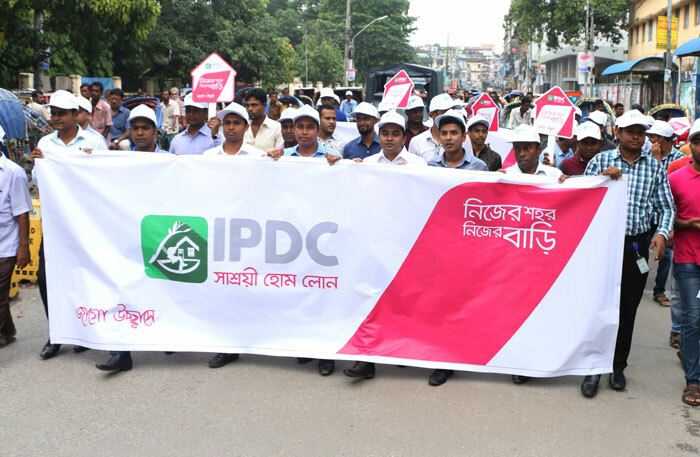 IPDC Finance Limited, the first financial institution of Bangladesh established in 1981, took up day long activities including road rally and miking with the slogan ‘Nijer Bari Nijer Shohor’. This campaign propagates the need, ease and affordable access to home loan for local people of Bogra. IPDC brought this product to solve home financing needs for those who have limited access to take loans from financial sectors. More than 300 people including Bogra Branch Manager, IPDC Finance Limited, Mr. Md. Mahmudur Rahman, Affordable Home Loan team and other senior officials have joined the rally which started from IPDC Finance Limited Bogra Branch to Saath Maatha road. Customers can take up to BDT 50 million for purchasing, constructing, renovating and expanding their home. IPDC Finance Limited, the first financial institution of Bangladesh established in 1981, handover tickets to hometown to the Eid Ucchash campaign winners. IPDC Finance Limited, the first financial institution of Bangladesh established in 1981, handover tickets to hometown to the Eid Ucchash campaign winners. IPDC Finance Limited organised this campaign in their official Facebook Page through which fifty lucky followers got a chance to visit their home town with a friend/family to celebrate the festive of Eid-Ul-Azha. A total of one hundred tickets was won by fifty lucky winners throughout the country for commenting their Eid plans on IPDC’s Eid Ucchash Campaign on their official Facebook page. Eid Ul Azha is the time of the year when residents of Dhaka travel to their home towns in hope to celebrate the festivity with their loved ones. Demand for tickets and seats exceeds the supply by a large margin at this time. 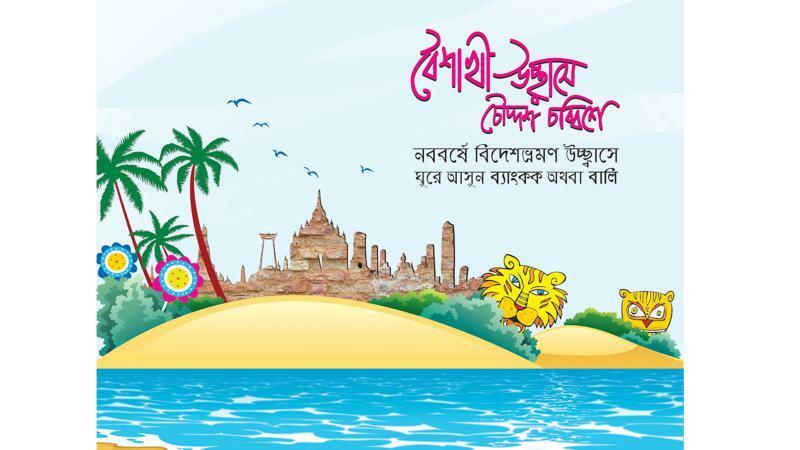 To alleviate this situation IPDC Finance, for the second time of this year, has launched the Eid Ucchash campaign, in which the followers of IPDC can get a chance to win tickets to visit their hometown. During the ticket handover ceremony in IPDC Finance Limited’s head office, a lucky winner said, "Amidst all the regular campaigns in Facebook, we keep looking forward to IPDC’s Eid ticket to hometown campaign. No other campaign has been able to cater to the need of the hour so well. I cannot thank IPDC enough letting me celebrate Eid with my family so easily." IPDC Finance Limited (previously known as "Industrial Promotion and Development Company of Bangladesh Limited") was founded and established by a distinguished group of shareholders namely Government of Bangladesh (Ministry of Industries and Ministry of Finance), International Finance Corporation (IFC), USA, German Investment and Development Company (DEG), Germany, The Aga Khan Fund for Economic Development (AKFED), Switzerland, and Commonwealth Development Corporation (CDC), UK. From the very inception, IPDC on record has been playing an instrumental role in building up the nation when it was in the phase of dire need. Yet again IPDC emerged to rise to the latent demands of the people, when the nation witnesses an era of exponential growth, which were least expected from any financial institution so far. It’s acting as a catalyst for expansion of industrial, commercial and educational sectors’. BRAC, the largest non-governmental organization of the world came in the picture as the major shareholder of IPDC Finance Limited. Subsequently, IPDC formulated a long-term strategy considering the challenges and opportunities posed by the Bangladesh economy in next few years. IPDC has realigned their focus on nationwide spread with diversified services to steer up its next phase of growth. To become the most passionate financial brand in the country with special focus on youth, women and underserved areas. IPDC Finance Limited has setup a new road map considering the implementation of a set of new strategies for the upcoming years. These strategies include 'A Home for Every Family’, ‘Empowering Women’, ‘Creating Entrepreneurs’, ‘Beyond Mega Cities’ and ‘Bring Convenience at Home’. In line with its vision to be the most passionate financial brand in the country, it has embraced a new logo and a pay off line "Jaago Ucchashe" that speaks loud of its perception behind the revamp of IPDC. IPDC not only promotes its offerings rather provide financial assistance by guiding the customers to reach the best fit for them in any FIs or banks. This way IPDC serves its customers to reach their goals conveniently and live their life unbound. IPDC presents Career Camp 2017 powered by Cooper's Bakery took place on the 5th of August 2017 at the Ismaili Jamatkhana and Centre. The event started off with a huge blast with the support of an enthusiastic crowd and exceptional speakers. 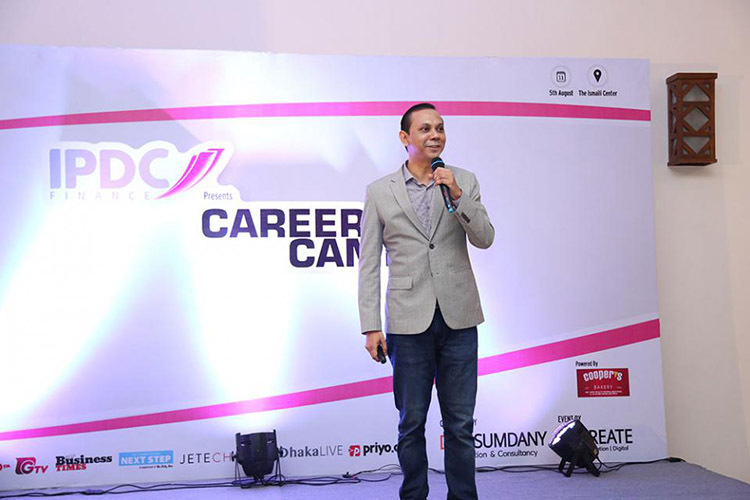 Career Camp is a signature event of Don Sumdany Facilitation and Consultancy. Speakers of the day included Rafiath Rashid Mithila (Head of Early Childhood Development, BRAC International, and actress); Rahel Ahmed (DMD, Prime Bank Ltd.); Shahriar Amin (Head of Marketing in a consumer goods’ multinational); Raquib Fakhrul Rocky (Managing Director, Munshi Enterprise Ltd.); Tajdin Hassan (Head of Marketing, The Daily Star); Mominul Islam (Managing Director & CEO, IPDC Finance); Ahmed Pasha (Director, Strategic HR, Edison Group); Golam Raihan (Regional Sales Manager—Bangladesh/Sri Lanka/ Nepal, P&G); and G. Sumdany Don (Chief Inspirational Officer, Don Sumdany Facilitation and Consultancy). 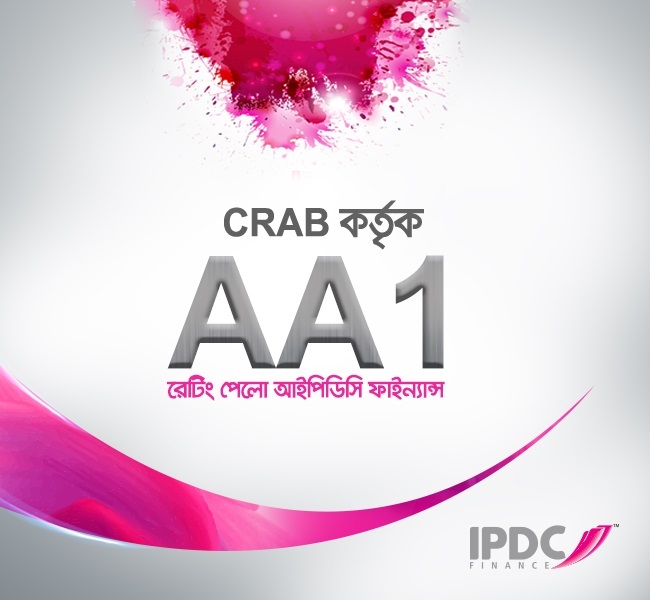 IPDC Finance Limited, the first financial institution of Bangladesh established in 1981, has been awarded with the prestigious rating, AA1 in the long term and ST-1 in short term from Credit Rating Agency of Bangladesh (CRAB). IPDC Finance Limited, the first financial institution of Bangladesh established in 1981, has been awarded with the prestigious rating, AA1 in the long term and ST-1 in short term from Credit Rating Agency of Bangladesh (CRAB). AA1 (long-term rating) affirms IPDC's strong capacity to meet its financial commitments. ST-1 (short-term rating) which is the highest in this category, underlines the strongest liquidity position and ability to make timely repayments. IPDC Finance Limited (previously known as "Industrial Promotion and Development Company of Bangladesh Limited") was founded and established by a distinguished group of shareholders namely Government of Bangladesh (Ministry of Industries and Ministry of Finance), International Finance Corporation (IFC), USA, German Investment and Development Company (DEG), Germany, The Aga Khan Fund for Economic Development (AKFED), Switzerland, and Commonwealth Development Corporation (CDC), UK. From the very inception, IPDC on record has been playing an instrumental role in building up the nation when it was in the phase of dire need. Yet again IPDC emerged to rise to the latent demands of the people, when the nation witnesses an era of exponential growth, which were least expected from any financial institution so far. It’s acting as a catalyst for expansion of industrial, commercial and educational sectors’. BRAC, the largest non-governmental organization of the world came in the picture as the major shareholder of IPDC Finance Limited. Subsequently, IPDC formulated a long-term strategy considering the challenges and opportunities posed by the Bangladesh economy in next few years. IPDC has realigned their focus on nationwide spread with diversified services to steer up its next phase of growth. To become the most passionate financial brand in the country with special focus on youth, women and underserved areas. IPDC Finance Limited has setup a new road map considering the implementation of a set of new strategies for the upcoming years. These strategies include ‘A Home for Every Family’, ‘Empowering Women’, ‘Creating Entrepreneurs’, ‘Beyond Mega Cities’ and ‘Bring Convenience at Home’. In line with its vision to be the most passionate financial brand in the country, it has embraced a new logo and a pay off line “Jaago Ucchashe” that speaks loud of its perception behind the revamp of IPDC. IPDC not only promotes its offerings rather provide financial assistance by guiding the customers to reach the best fit for them in any FIs or banks. This way IPDC serves its customers to reach their goals conveniently and live their life unbound. IPDC Finance Limited, the first financial institution of Bangladesh established in 1981, has taken a noble initiative of partnering with Toys R Yours, a community based initiative by the Ex-Cadets Forum to collect toys and distribute those among the underprivileged children of Bangladesh. This year IPDC has not only contributed towards distributing toys but also establishing three new libraries and nurtured the future of 700 beneficiaries so far. 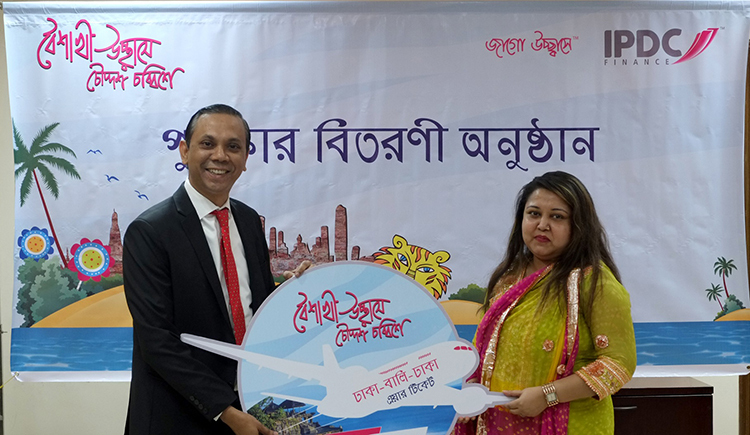 IPDC Finance Limited, the first financial institution of Bangladesh established in 1981, has announced the winners of its ‘Pohela Boishak Offer’. Ms. Marzia Begum has won the mega prize of a round trip tickets to Bali. 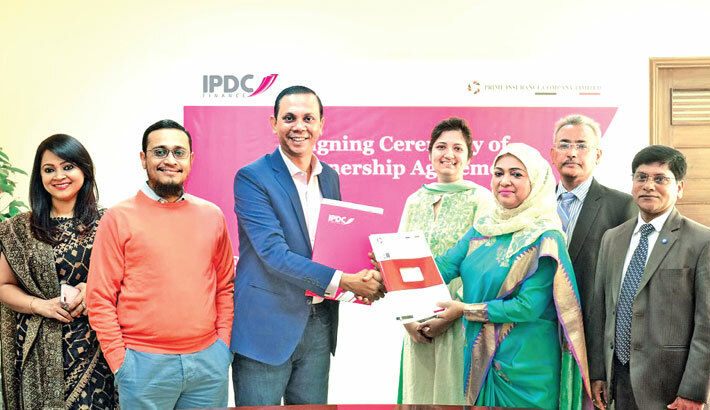 IPDC Finance Limited, the first financial institution of Bangladesh established in 1981, has announced the winners of its ‘Pohela Boishak Offer’. Ms. Marzia Begum has won the mega prize of a round trip tickets to Bali. Three other lucky winner got the chance to win tickets for a round trip to Bangkok. The winners were selected through raffle draw for its individual retail customers. The customer won this award by availing auto loan, home loan or personal loan from IPDC Finance Limited. Mr. Mominul Islam, Managing Director & CEO, IPDC Finance Limited distributed the prize among the winner. IPDC Finance Limited, the first financial institution of Bangladesh established in 1981, has signed an agreement with Bangladesh Bank under “Refinance Scheme for setting up Agro-based Industries in Rural Areas” today at Bangladesh Bank main office. 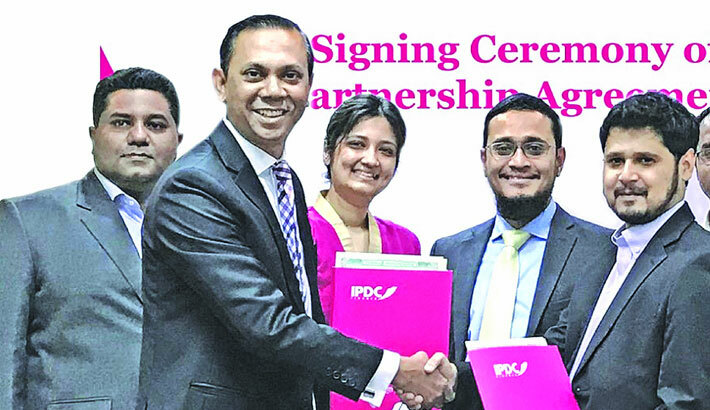 IPDC Finance Limited, the first financial institution of Bangladesh established in 1981, has signed an agreement with Bangladesh Bank under “Refinance Scheme for setting up Agro-based Industries in Rural Areas” today at Bangladesh Bank main office. Under this new scheme rural agro based industry will experience convenient formal financing service and eventually result in agricultural growth in rural and sub-urban economy. 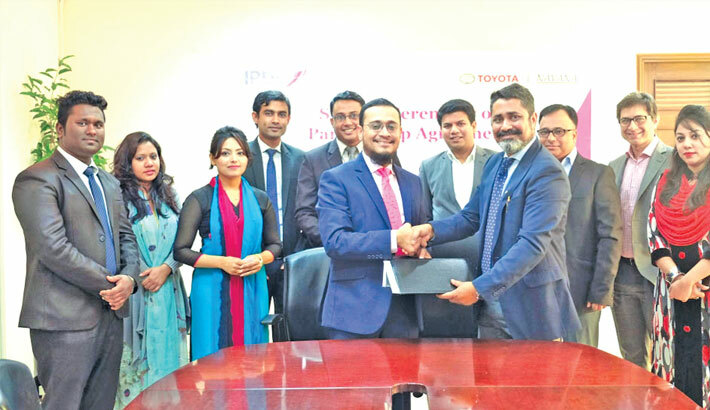 At the signing ceremony, Mr. Mominul Islam, Managing Director & CEO, Mr. AFM Barkatullah, DMD & Head of Retail Business, Nawed Wahed Asif, Head of Treasury and Mr. Rizwan D. Shams, GM & Head of Business Finance, of IPDC Finance Limited, Deputy Governor of Bangladesh Bank S.K Sur Chowdhury and Executive Director of Bangladesh Bank Md. Abdur Rahim were present at the signing ceremony. 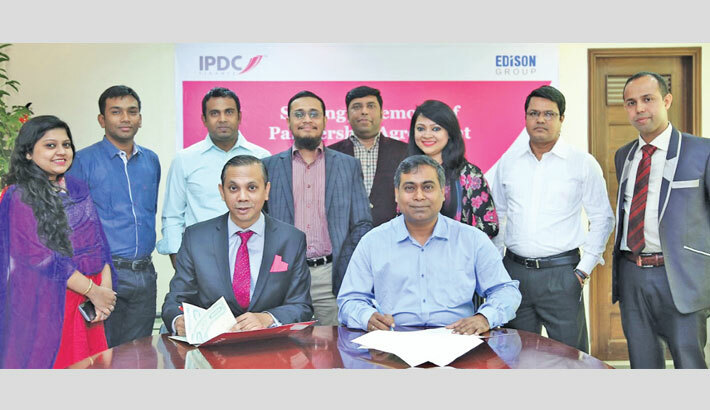 IPDC Finance Limited, the first financial institution of Bangladesh established in 1981, has announced the winners of the Eid Ucchash campaign. IPDC Finance Limited, the first financial institution of Bangladesh established in 1981, has announced the winners of the Eid Ucchash campaign. IPDC Finance Limited recently organised a campaign through their official Facebook Page through which followers were prompted to comment their Eid plans on the Eid campaign post, for a chance to win a trip to their home town with a friend. The districts where the winners won trip from Dhaka are Chittagong, Khulna, Barisal, Rajshahi, Sylhet, Mymensingh and Rangpur. The winners of this campaign are Ms. Parvin Mona from Rangpur, Mr. Faishal Ahamed from Barishal, Mr. Ziauddin Mortuza from Sylhet, Mr. Farhan Jawad from Mymensingh, Mr. Izaz Mahmood from Chittagong, Mr. Rafsun Rafique from Khulna and Mr. Iftakharul Alam from Rajshahi. Eid Ul Fitr is the time of the year when residents of Dhaka travels to their home towns in hopes to celebrate the festivity with loved ones. Demand for tickets and seats exceeds the supply by a large margin. To help alleviate this situation and provide a solution, for the first time ever IPDC Finance is launched the Eid Ucchash campaign, in which followers of IPDC have a chance to win tickets to their hometown. IPDC comes forward to take care of all endeavor of Fahad Rahman the FIDE Chess Master Fahad Rahman. Clearly moving by the passion, IPDC takes immense interest in youth and is working hard to establishing its footprints towards it. 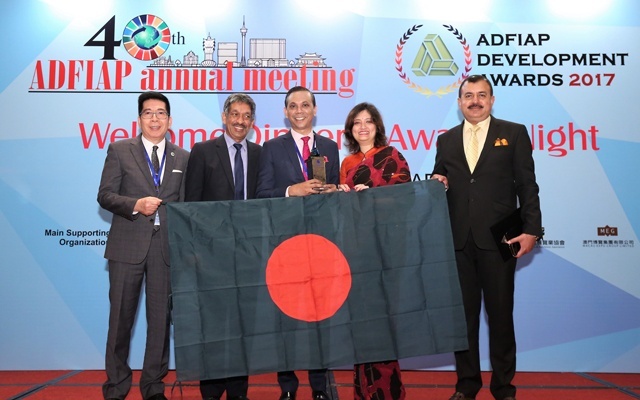 IPDC Finance becomes the first Bangladeshi institution to win the ADFIAP award for its Corporate Social Responsibility in 2016. IPDC Finance Ltd signed a partnership agreement with PRAN-RFL Group at a city hotel recently. Managing Director & CEO of IPDC Finance Mominul Islam, Director (Finance) Ms Uzma Chowdhury and General Manager (Finance) of PRAN-RFL Group Samir Uddin were present on the occasion. Sonajan Akter is not familiar with the razzle-dazzle of an award show. She looked a little surprised when she came across glittering lights, colourful decorations and loud sound at the city's Krishibid Institution Bangladesh last night. The 68-year old midwife from Manikganj, who has selflessly been providing care to newborns and pregnant women in her locality for the last 50 years, also did not expect any reward for her work. “I don't look for anything in return. I rush to those in need because I just can't say no to anyone,” said Sonajan, who also volunteers to wash the bodies of deceased women before burial. Unsung heroes like her, who work tirelessly for the wellbeing of others, however, do not always go unrewarded. IPDC Finance Limited in association with The Daily Star presented the first “Unsung Women Nation Builders Awards” to Sonajan and six other women at a packed auditorium of the Krishibid institution near Farmgate, acknowledging their unique contributions to the socio-economic development of the country. Sonajan was awarded for her contribution to healthcare. The other awardees are: child rights activist Shahida Akhter Shorna (courageous act); Bhagya Rani Banik, director general of Bangladesh Rice Research Institute (agriculture); Fatema Begum, additional inspector general of police (courageous act); Rokeya Begum, assistant teacher of Tambulkhana Government Primary School (education); Maftahul Jannat Likhon (entrepreneurship); and senior nurse Irani Baroi (health). An independent jury panel consisting of writer and the Daily Prothom Alo Associate Editor Anisul Hoque, Mohammadi Group Managing Director Rubana Huq, and ActionAid Bangladesh Country Director Farah Kabir selected the winners. Information Minister Hasanul Haq Inu and Parveen Mahmud FCA, chairperson of the Micro Industries Development Assistance and Services (MIDAS), handed over the awards -- a crest and a cheque of Tk 2 lakh -- to each of the awardees. Addressing the ceremony as chief guest, Inu thanked The Daily Star and IPDC Finance Ltd for the initiative to find out and recognise the women who have been working silently, braving all odds, to establish social justice and empower women. Those who play an important role in building the nation should be recognised to inspire others to follow their path, he said. “The nation that does not recognise heroes cannot create new heroes,” Inu said and added that he would “advise the state to organise such award ceremonies as well”. He said women still today face a lot of harassments and discrimination at their workplaces and even in families. Despite that, women were making significant contributions to the society, he added. Inu said there were inherent practices of discriminating women over property-related issues and suggested that such discriminations should end. He said he was humbled by the greatness of the awardees and added that the recognition would boost their confidence to do even better. MIDAS Chairperson Parveen Mahmud said those who work in silence, behind the scene, should get more recognition. 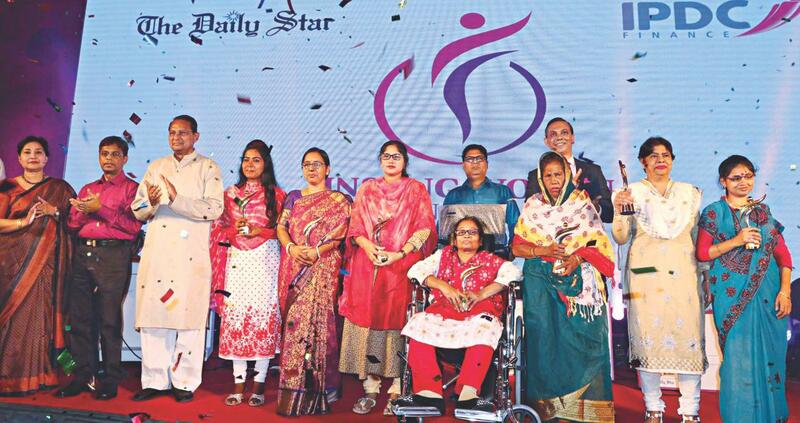 The Daily Star Editor and Publisher Mahfuz Anam said the idea behind the award was to recognise the women who are silently serving their communities at the grassroots but remain unnoticed. “Their examples in serving the community and helping fellow human beings make them superior to many of us. I hope this recognition inspires others to serve humanity in the same way,” he said. Anam said the basic human qualities that everybody has in them should not wither in the busy urban life. Shahida Akhter Shorna said she started to work for women empowerment after noticing discrimination between men and women in her childhood. “I want all women to be educated and protest any discrimination,” she told this correspondent. Bhagya Rani Banik said she had been committed to agricultural research, and that the award would inspire others to work more for the public interest. She also thanked the government for its women-friendly policies in various sectors. Fatema Begum said women's contributions to the society largely remained ignored and the initiative to award the seven women would pave the way for others to do something good for the society. Rokeya Begum said the award meant a lot of inspiration for her to go forward with her goal to promote female education. Maftahul Jannat Likhon said she was feeling encouraged to work more for the poor children who are deprived of education. “I studied up to class six. I don't want others to be like me. I want them to have education and earn dignity,” she said. Rokia Afzal Rahman, chairperson of Mediaworld Limited; Geeti Ara Safia Choudhury, adviser to a former caretaker government; Shaheen Anam, executive director of Manusher Jonno Foundation; Inspector General of Police AKM Shahidul Hoque; magician Jewel Aich and representatives from several foreign missions in Dhaka, among others, were present at the ceremony. The programme, moderated by singer and journalist Elita Karim, also featured short screening of documentaries on each of the awardees and a cultural show. When she became the director general of BRRI in June 2016, Bhagya Rani Banik was the first woman to hold that post. Agriculture University in 2003. She has significant contribution in food sufficiency and climate change research. Under her leadership BRRI has achieved international success. She has contributed in developing better breed of corn. She has 37 research articles published in national and international scientific journals. Even though her legs became paralysed, Irani Baroi did not give up her mission of helping the sick. Irani is a senior nurse today at the 100-bed general hospital in Madaripur. She earned her diploma in Nursing from Dhaka Medical College and Hospital in 1986 and started her career in Madaripur General Hospital. She came down with fever in 1996 and her hands and legs became paralysed. Therapy brought back the use of her hands but her legs did not improve. Despite being paralyzed, she is by no means inferior to any other nurse in her hospital, her patients, superiors, and coworkers testify. She believes as long as she can use her hands, she can continue to help her patients in every way possible. Fatema Begum is one of the first two women who chose to join the police service after their Bangladesh Civil Service (BCS) exam in 1984. The other quitted soon but she continues to serve in the police and became the first woman to become an additional inspector general of police. “Firm in their belief that the police force was no place for women, they tried to make us leave from the very first day -- beginning with barring our entry at the orientation for new officers,” says Fatema. She was forced by her bosses to write to the home ministry asking it to give her a posting in some other cadre service. After the training was over, the male officers were ordered to pack and go to the Police Academy. But there was no instruction for Fatema. She waited and waited, but no orders came. A couple of days later, she wrote to the Police Headquarters saying she would not give up her job and that she would rather wait further. She was allowed to go to the academy after she persisted. Rokeya Begum, who became blind at the age of 3, is an assistant teacher of Tambulkhana govt primary school. Her indomitable spirit has brought her to this position. She teaches like any regular teacher. Moreover, she is a popular teacher. She had to struggle to be here today. Her father Sheikh Mujibor Rahaman died leaving five daughters and one son. Three of the sisters are also blind. When her mother also died after a few years, their elder sister Sahanaj Begum took them in. Now Rokeya's two blind sisters are in University. Shekha Begum, 29, is a student of MA in the Department of Social Science at Eden Mohila College Dhaka. Ashia Akter, 22, is a student of BA in the Department of History at Dhaka University. Sonajan Akter of Chowbaria at Manikganj has been serving as a midwife for the entire village as well as at least 15 other villages for the past 50 years. The sixty-eight-year-old does not accept any payment for her services despite her family being extremely poor. She takes care of the mothers, and later, their babies, for up to 10 days after birth. Relatives and acquaintances testify she looks after the mothers and children just as a grandmother would-- with utmost care and affection. Because Maftahul Jannat Likhon decided to install solar panels free of charge in three villages two years back, students from the poorest families can now study at night in these villages of Joypurhat's Panchbibi upazila. When many people would leave empty handed from her solar power sales center because of the high price, she started to feel the problems children faced in those families. She felt children from the poorest of families should have a fair chance to go to school and having bright lights to study at night could boost their morale. Nowadays, the three villages are collectively called “Solargram” and 148 families have solar lights because Likhan felt that she had to do something to help. But bright lights are not enough. One also needs books. In March this year, Likhan visited her Solargram with bundles of children's books to be distributed for free. From solar lights to light of knowledge, Likhan has them all. For her work against child marriage, Shahida Akhter Shorna was dubbed the 'Malala of Bangla' by Norwegian Prime Minister Erna Solberg at an international conference of Plan International, an organisation that works for children's rights worldwide. Shorna endured pressure for early marriage like all the other girls in her village. Her elder sisters, all four of them, had given in without a protest when their time came. But Shorna did not. She was adamant that completing her education was her first priority. It was her wholehearted campaign for girls' education in her village that put her on par with Malala Yousafzai. Although there were no gun-toting Taliban insurgents patrolling her village, hers was no less challenging a task than Malala's. President of Gazipur's Mawna Union Shishu Forum of Plan Bangladesh, where she joined in 2006, Shorna is now a marriage-buster in her community and also an icon. She has stopped six child marriages in her union so far. Shorna always took it upon herself to organise students for different events. She showed her leadership quality during those programmes. Shorna, who once wanted to be a doctor, now wants to serve the society by becoming a university or college teacher. at 3:00 PM to consider, among others, un-audited financial statements of the Company for the First Quarter (Q1) period ended on March 31, 2017. A number of celebrities of the country’s cultural arena inspired the children with special needs by observing their Pahela Baishakh with them on Friday. A number of celebrities of the country’s cultural arena inspired the children with special needs by observing their Pahela Baishakh with them on Friday.As part of its New Year celebrations, the Youth Bangla Cultural Forum arranged the programme at Dhanmondi in the capital.A total of 40 special need children from across the city participated in the celebration programme.The children spent their time by participating in different events like drawing competition, sports and rendering songs during the celebration.Celebrities including Saberi Alam, Tanvin Sweety, Shabnaz, Maznun Mizan, Mona Chowdhury, Sharmin Shila, Dipa Khondokar, Noushin, Hillol, Said Babu, Kalyan, Rashed Mamun Apu, Obid Rehan, Tanvir, Samia, Akhi Afroz, Rose, Priya Aman, Amrita Khan, Aman Reza, Mohan Khan, Kobir Bakul, Dinat Jahan Munni, Swagata, Sabyata and Sondhi attended the event. Three tickets fo Thailand and one mega prize which gives a chance to fly Bali. The offer starts from April 4, 2017 to 31st May 2017. The amound of Auto Loan, Home Loan, Personal Loan or deposit should be of worth BDT 5 lac or more. Any applicant who crosses the disbursement within this period is eligibel for this raffle draw. 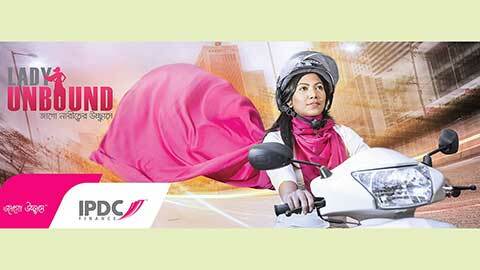 Established in 1981, IPDC Finance brings breakthrough offer for its female customers under the name "Lady Unbound" . This features are heading towards the women empowerment in the country. The three offer under "Lady Unbound" is a dedicated relationship manager on any service, free Brac driving school on Auto Loan customers and on deposit worth BDT 10 Lac or above, women get to enjoy an exquisite dinner in Radisson Blu with a companion. MD and CEO of the company, Mr. Mominul Islam says "True essence of freedom comes from financial freedom and that is possble with more and more entitlements in private properties for women and Lady Unbound is one such initiative towards this motive." The Daily Star and IPDC Finance Limited will bring the lives of these change makers to the forefront and share their stories with the world. People can nominate women nation builders from their surroundings and share their success stories at unsungwomen@gmail.com or on +8801785444111. The selection of the awardees will be done by an independent panel of judges. Director Ahmed Pasha sign an agreement in the capital recently. The Board of Directors of IPDC Finance Limited (IPDC) has recommended 20 per cent stock dividend for its shareholders for the year that concluded on December 31, 2016. The annual general meeting (AGM) of IPDC will be held at 9:00am on May 2, 2017. Venue of the AGM will be notified later. The company’s record date for AGM is on March 13, 2017. The company has also reported EPS of Tk 2.00 NAV per share of Tk 18.32 and NOCFPS of Tk 7.48 for the same year as against Tk 1.59 (restated), Tk 16.33 (restated) and Tk 2.13 (restated) respectively for the same period of the previous year. The lucky winners of this Valentine’s Day offer were Nabila Esha, Promi Faria, Mashroor Faiyaz Khan, Adiba Samantha Parvez and Tazrian Binte Zaman. 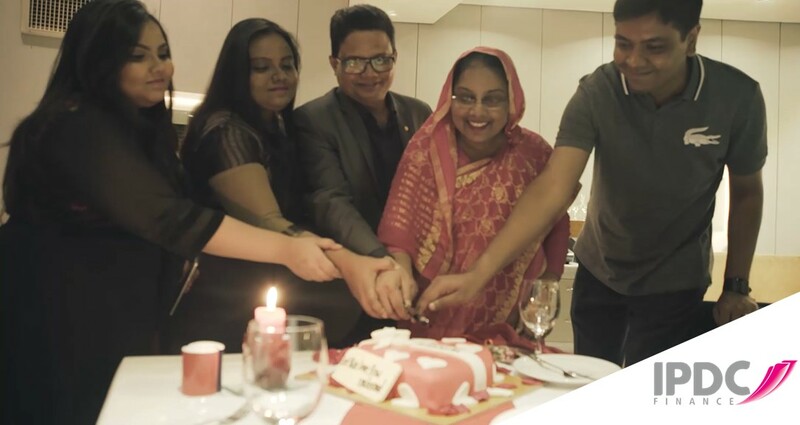 The winners got the chance to surprise their parents with a Romantic Dinner on 14 February 2017 at the Radisson Blue Dhaka Water Garden by sharing a picture of their parents in love along with a short story of their coming together in the messages or comments in IPDC’s Facebook page. The last day of submission was 11:59 PM, 10th February, 2017. Each winner brought their parents at Radisson Blu Dhaka water garden. The surprise was revealed with a nice flower bouquet. The parents then enjoyed a lovely dinner in a romantic setup. Later, the winners along with their parents cut a cake written “Let This Love Flow Unbound”. IPDC Finance Limited & Navana brings unbelievable offer. IPDC Finance Limited has recently signed an agreement with Navana Limited. As per this agreement, consumers can avail unique offers on selective models of Toyota taking auto loans from IPDC Finance Limited. DMD, IPDC Finance Limited, AFM Barkatullah and Head of Operations, Navana Limited, Hamdur Rahaman Simon with other high officials of IPDC Finance Limited and Navana Limited were present. Mohammodi Khanam, CEO of Prime Insurance Company and Mr. Mominul Islam, CEO of IPDC Finance Limited exchanged a signing agreement of Home Loan Protection Insurance policy recently at the head office of IPDC Finance Limited. Home loan protection Insurance policy is one of the latest business policies of Prime Insurance Company Ltd. By taking this policy financial institution & their clients both will be benefited. This policy ensures the clients home protection. On the agreement signing period Mr. AFM Barkatullah (DMD) & other top level personnel of IPDC Finance Ltd.; Syed Monirul Huq (DMD & Head of Operations), Mr. Sujit Kumar Bhowmik (AMD & Head of SBMD & Health Insurance), Ms. Tithia Rahman (Deputy Manager & Head of PR & CA) of Prime Insurance Company were also presented there. With the aim to help improve the lives for the underprivileged children, a fundraising concert will be held at the Krishibid Institution Bangladesh (KIB) in the capital’s Farmgate area on February 3. The concert has been arranged by Distressed Children & Infants International (DCI), in collaboration with IPDC Finance Limited, the first financial institution of Bangladesh. To make a formal announcement centring the upcoming concert, a press conference was organised yesterday at the Meghna Hall, Pan Pacific Sonargaon Hotel in the capital. The top artistes including Sabina Yasmin, Babita Akhtar (Actress), Ayub Bachchu, Syed Abdul Hadi, Haider Hussain, Benuka Institute of Arts, Lora Chowdhury (Keynote Celebrity Speaker from University of Vanderbilt) and a ten member musician team are also enlightening their presence for this cause and agreed to perform in the concert voluntarily. Present at this press conference were two of the top legendary musicians of music industry of Bangladesh-- Haider Hussain and Ayub Bachchu, top officials of IPDC, including Mominul Islam, MD and CEO, IPDC Finance Limited, AFM Barkatullah, Deputy Managing Director, IPDC Finance Limited and Dr Ehsan Hoque, MBBS, PhD, Executive Director and founder of DCI and Dr Muhammad Abdul Mazid, Advisor, DCI; Chairman of Chittagong Stock Exchange. 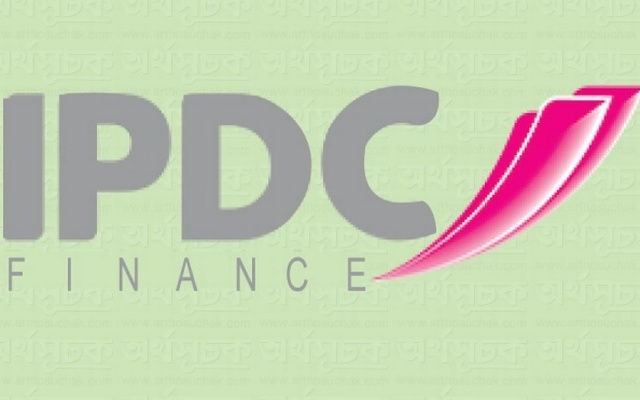 IPDC Finance Limited launched its new offers for home loan, auto loan, personal loan and deposits partnering with Prime Insurance, Banglalink, Radisson Blu, Dhaka, Motor Diagnostic and Treatment, BRAC and Hafele. IPDC Finance Limited launched its new offers for home loan, auto loan, personal loan and deposits. 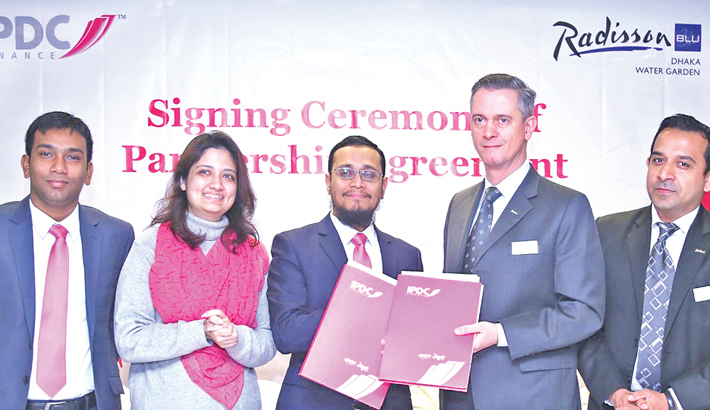 This includes offers for Prime Insurance, Banglalink, Radisson Blu, Dhaka, Motor Diagnostic and Treatment, BRAC and Hafele, said a statement. The home loans offer customers free home insurance from Prime Insurance and discounts of 15 per cent in Hafele's showrooms. With the auto loans, customers will get three free servicing from Motor Diagnostic and Treatment and free vehicle tracker with six months' subscription from BDcom. Besides, the female customers of auto loan will be getting a wonderful opportunity of free driving lessons from BRAC. With every personal loan and the deposit of Tk 1.0 million or more, customers can enjoy free dinner for two at Radisson Blu, Dhaka. "IPDC has continuously been the major driving force behind the industrial development of Bangladesh since 1981. In 2017, we have plans to provide our valued customers with the best offers.'' At IPDC Finance Limited, we value our customers' interests and thus introduced all these offers" says Mominul Islam, Managing Director and CEO, IPDC Finance Limited. Concito PR Managing Director Moeen Tariq exchange documents after signing an agreement at the IPDC head office at Gulshan in the capital recently. The Industrial Promotion and Development Company of Bangladesh yesterday re-launched itself as IPDC Finance. 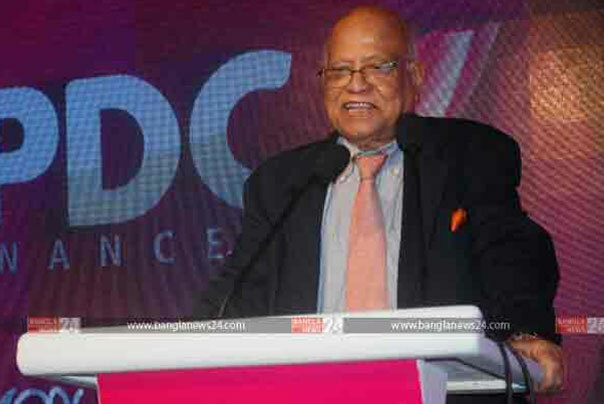 Finance Minister AMA Muhith attended the event as the chief guest at Radisson Hotel in Dhaka.Sir Fazle Hasan Abed, founder and chairperson of Brac, and Mominul Islam, CEO of IPDC Finance Ltd, were also present along with the high officials of Bangladesh Bank. "IPDC has made some major changes to ensure efficient organisational management and maximum risk management in its operations," the company said in a statement yesterday. 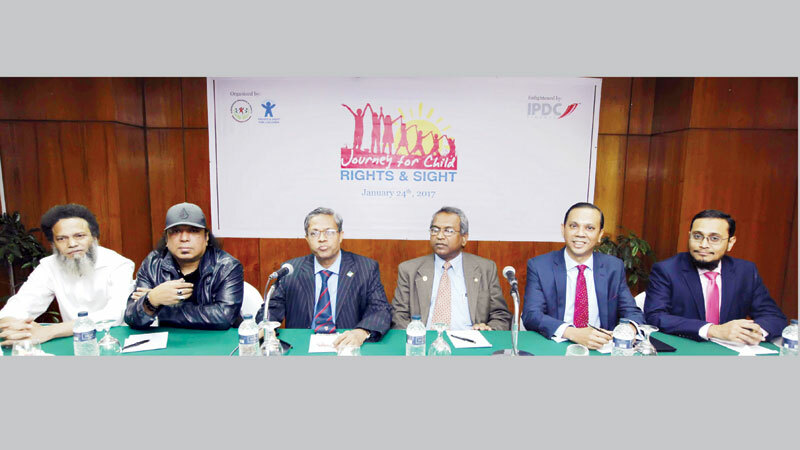 IPDC has continuously been the major driving force behind the industrial development of Bangladesh since the establishment of the company in 1981, said Islam. In 2015, Brac, the world's top non-governmental organisation; Ayesha Abed Foundation, RSA Capital, Aga Khan Fund for Economic Development, RSA Capital, general public and the Bangladesh government became the major stakeholders of IPDC. IPDC Finance has created a long-term work plan to create a positive socio economic development, the company said.